Went car shopping today - tried many a car - but surprisingly found this at the toy store nearby and been needing one since. After an overload of features and mileage and various performance packages, etc - this one was SO simple and SO fun. Jermacide and I were riding around INSIDE a toy store on these (keep in mind he’s a 6’ guy). Canadian invention, you sit and wiggle the steering wheel and off you go! (Check out the Discovery Channel Clip about the physics behind it) It’s been winning many awards around the world, but look at the design! … not to mention it’s called the Plasma Car. Although the ages say 3-12 i’d give it an “anyone who’s agile enough to sit on it” age limit… it was really comfortable, and you can really get moving on it. Great for hallways and getting around at work, i think Google needs these to join their fleet of Segways, motorized scooters, and mini bikes. 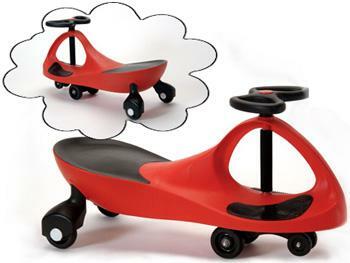 will to introduce our new recline tricycle product, the product name is “Drift Rider”. The product primary objective of the present invention is to provide a recline tricycle, when maneuverability is diversified to have more fun.